While it appears that the use of margin debt has stabilized, and even increased since its February lows, it is not neccessarily a sign of a market bottom. One only has to look at the use of margin debt over the last business cycle to see why. 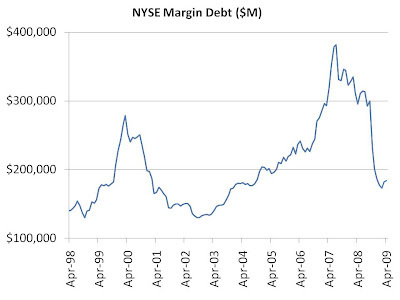 The chart clearly shows that there were many instances of upticks in the use of margin debt even as the trend continued lower throughout the early part of this decade. Just because margin debt has stabilized at its current level for now does not mean it's on the way up (which would help buoy prices) or even that it will stay at current levels. Charts like these can help us determine where investor sentiment currently stands as compared to the last decade, not what sentiment is going to be like in the future. Investors who believe the market will quickly return to its former heights are not heeding the lessons of history. There must be margin information further that 1998. Margin accounts were regulated. It would be interesting to know the historical comparison.